Waltz III and IV from "4 Waltzes for flute, clarinet and piano"
Emma Hunt, clarinettist, has recently completed her Masters in Music Performance Research in March 2011. Highlights of Emma’s 10 year career as a musician include receiving one of two places to undertake an exchange year at the prestigious Royal Academy of Music in London (2007), performing 3 concertos with Sydney based orchestras (2009, 2010) and touring with the Conservatorium of Music Chamber Orchestra as principal clarinet (2010). In addition to this Emma has performed with the renowned Young Musician’s Symphony Orchestra of London, Sydney Sinfonia (casually), SBS Youth Orchestra, and the Wollongong Symphony Orchestra, recorded music for short films and advertisements, premiered Australian works with Chronology Arts, received places in numerous eisteddfods and won several scholarships. Emma’s primary musical endeavours currently involve performing regularly with Chronology Arts and Trois, a flute, clarinet and piano trio. Whilst Chronology focuses solely on contemporary music, Trois performs a range of repertoire, ranging from Baroque through to early twentieth century, with some works transcribed and arranged by the group in order to expand the repertoire for this particular instrumentation. Jane Duncan is a freelance musician currently living and working in Sydney. She has recently completed of a Master of Music degree at the Sydney Conservatorium of Music towards which she gained a high distinction. In 2004-2005 Jane attended the Royal College of Music in London on an exchange scholarship. She has also performed with the Sydney Conservatorium of Music’s Symphony and Chamber Orchestras and in 2000 Jane recorded a concerto with the Sydney Symphony Orchestra. As a semi-finalist in the 2MBS-FM Young Performers Awards, Jane has given two live solo recitals on radio and has performed her own composition at the Sydney Opera House. Jane’s interest in contemporary music was sparked a number of years ago, and has lead her to research, perform and write about the electroacoustic works of Finnish composer Kaija Saariaho in particular. In 2007 Jane presented a paper in Brisbane on the performance practice issues in works for flute with electronics at ‘Islands’, the conference of the Musicological Societies of Australia and New Zealand. 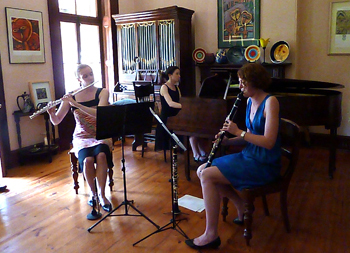 As a core member of new music ensemble Chronology Arts, Jane enjoys premiering new works by emerging composers for flute, piccolo, alto flute and bass flute. Amy Putt recently completed a Bachelor of Music (Performance Honours) at the Sydney Conservatorium of Music under teachers Clemens Leske and David Miller. After being awarded the prestigious Margaret Henderson scholarship in her first year, she subsequently won the Conservatorium Concerto Competition, and an exchange scholarship which took her to the Hochschule für Künste Bremen in 2009. In Germany, she studied accompaniment with Günther Herzfeld and solo piano with Patrick O’Byrne; following this, she was invited to play as a repetiteur in the 2009 Ronald Dowd Summer School for Opera, under the direction of Victor Morris. During her time at the Conservatorium, Amy has been selected to perform in masterclasses with various international artists, some of whom include Carolyn Warner of the Cleveland Duo, violinist Ning Feng, members of the Grainger String Quartet, and pianists Beata Cywinska, John Chen and Thomas Otten. Amy is enjoying working as a freelance musician and currently plays and performs with the Sydney Children's Choir, the Sydney University Graduate Choir, Tangalo (a tango ensemble), music theatre groups and various chamber ensembles. Amy has begun a Masters in Music Performance Research at the Conservatorium this semester.